The Trail Conference builds and maintains trails so everyone has the chance to experience the natural beauty that surrounds us. In 1920, the trail-building pioneers of the Trail Conference blazed Harriman State Park’s first trail, the Ramapo-Dunderberg Trail, creating a legacy of connecting people with nature. Three years later, our volunteers built the very first section of the Appalachian Trail, through Harriman-Bear Mountain. Ever since, we have worked with our park partners to plan, construct, and restore new and existing trails, building and caring for one of the nation’s finest network of trails serving a major metropolitan area. Volunteers learn trail construction techniques through hands-on instruction provided by the Trail Conference’s Trail University courses. 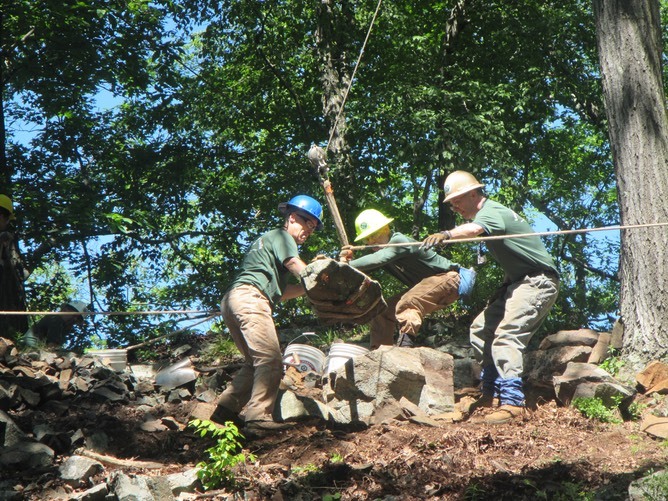 You can join any of the Trail Conference’s crews on scheduled work trips to practice this craft and gain additional skills, or apply to be a member of our Conservation Corps. On any given day on the trail, there's a good chance you'll encounter a Trail Conference volunteer working hard to improve your outdoor experience. Volunteers who "adopt" a trail do the on-the-ground work to ensure it remains open and safe for fellow users. A number of our crews also go out on maintenance trips to help keep trails accessible. If you have a passion for the outdoors, we'll provide you with the skills and opportunities to give back to the trails you love. No experience necessary!